By the time you'd graduated from college, your student loans had likely reached a daunting amount. In fact, the average member of the class of 2016 had $37,172 in debt. But as scary as the total may sound, rushing to pay off those debts is usually a bad move. Not all debt is bad debt. While experts offer differing opinions on exactly which types of debt should be considered good versus bad, everyone agrees that debt on something that will end up making you money in the long term is good debt. And by this strictest of definitions, student loans definitely qualify as good debt. A 2013 study based on Labor Department statistics showed that Americans holding a four-year college degree made 98% more per hour on average than those without a degree. Clearly, that college education you just completed will end up making you far more money than you spent to get it. And "good debt" is typically a low priority to pay off, compared to other expenses you may be carrying. Different types of debt can vary widely in how much they cost the borrower. Credit card debt is typically the most expensive, with exorbitantly high interest rates and a remarkable array of fees. Mortgage debt falls on the other end of the debt spectrum, with exceptionally low interest rates. Student loans fall somewhere in between the two, but they're closer to mortgages than credit cards cost-wise, especially for federal student loans. The interest rate for undergraduate federal student loans disbursed in the latter half of 2017 is 4.45%; the rate for federal graduate student loans is 6%. Compare that to the average credit card APR of 15.59%, and you'll see that federal student loans are cheap indeed. 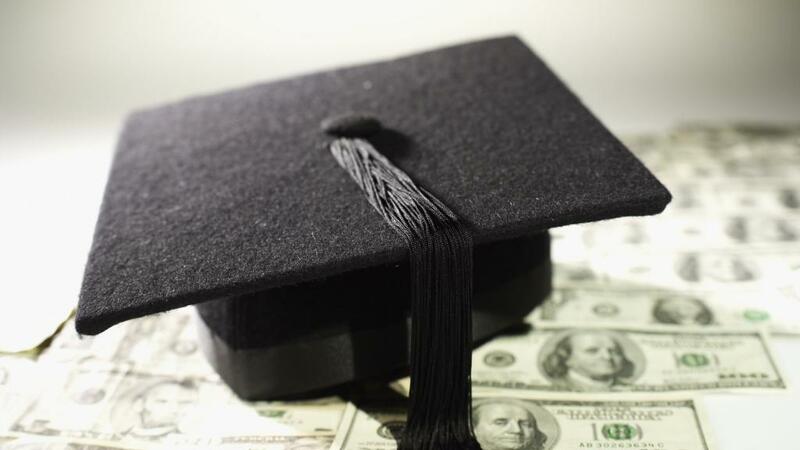 Private student loans can be another matter. As with most forms of credit, private student loan interest rates are based on your credit score: The higher your score when you get the loan, the lower your rate will be. Of course, someone about to start or in the middle of attending college likely has little to no credit history to work from, so students are likely to get stuck with mediocre rates. As of 2017, private student loans range from around 4.75% to around 14.75% for fixed-rate loans, and from 3% to 12.73% for variable-rate loans. If your private loans fall into the middle or high end of this range, consider getting a loan consolidation. You can't consolidate private loans with federal loans, but if your credit has improved since your student days, you can likely get a better rate on a new private loan to replace the old ones. Whatever your situation may be, there's a federal student loan repayment plan for that. The Department of Education allows you to choose from a menu of eight different repayment plan options, several of which are designed for borrowers with low income levels. If one repayment plan isn't working for you, you can simply switch to a different one. Private lenders aren't nearly as generous with payment plans, for the most part, although most will give you what's called "financial hardship forbearance." That means you can suspend your payments for a while due to financial hardship (although interest will keep accruing during the hardship period). Four of the aforementioned federal student loan repayment plans can result in automatic debt forgiveness. If you choose the Income-Based Repayment Plan, the Income-Contingent Repayment Plan, or either of the Pay As You Earn Repayment Plans, any balance you owe on your federal loans after 25 years will be automatically forgiven. It's safe to say that your credit card provider is not going to just forgive any debt that's still hanging on your cards a few decades from now. Since private student loans aren't nearly as good a deal as federal ones, paying them off before the federal ones makes a lot of sense -- especially if you can't get a good consolidation deal on them. However, there may be other financial tasks that rate even higher than those private loans. For one thing, you can work on paying off any bad debt you have -- particularly credit card debt -- which will save you a pile of money in the long run, since the faster you get rid of such debt, the less interest you'll pay over the life of the debt. Once you've slain the credit card debt monster, you can direct your extra income toward saving for retirement. Building up your retirement savings as early as possible gives that money the maximum amount of time to grow, leading to a much more impressive balance once you're ready to retire. It's also wise to tuck away some money in an emergency savings account, in case your car breaks down or you lose your job. Getting rid of these expenses will give you a far richer reward than getting rid of your student loans would.